Los Angeles-based SBE Entertainment, owner of the SLS Las Vegas, recently agreed to purchase New York-based Morgans Hotel Group, owner of the Delano brand and other holdings in Las Vegas. The deal gives SBE the Delano label in Las Vegas under a long-term licensing agreement with MGM Resorts International, which also manages the property. Under the agreement, SBE will acquire Morgans in an all-cash deal for $2.25 a share, amounting to about $82 million. Including assumed debt and the transfer of capitalized leases, the total enterprise value equates to about $794 million. The transaction is expected to close in the third or fourth quarter. Morgans portfolio includes 13 owned, operated or licensed hotels across regions including London, Los Angeles, New York, Miami and San Francisco. SBE will have about 20 hotels including the SLS Las Vegas, and about 90 restaurants after the deal closes. Affiliates of West Hollywood, California-based Yucaipa Cos. will exchange $75 million in Series A preferred shares, accrued dividends and warrants in Morgans for shares and common equity equaling $75 million in SBE, Morgans said in a statement. Yucaipa affiliates will control leasing interests in three Las Vegas restaurants. First-quarter net income and revenue increased for American Casinos &Entertainment Properties, owner of Stratosphere and other Southern Nevada properties. American Casinos, which also owns two Arizona Charlie’s properties in Las Vegas and the Aquarius in Laughlin, said its net income was $12.5 million in the first quarter, up from $8 million a year earlier2015. Net revenue increased 3.8 percent to $98 million from $94.4 million2015. Increases in slot and table game revenue, higher average daily room rates and higher average revenue per food cover boosted results, American Casinos said in a statement. Net revenue has increased in each of the last nine quarters. 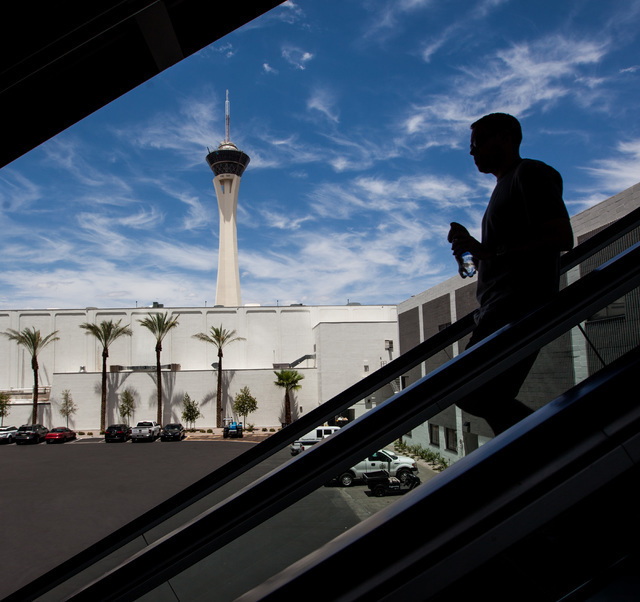 The Stratosphere’s net revenue rose 11.6 percent in the first quarter from a year earlier. Hotel revenue increased 18.9 percent from a year earlier, helped by a a 6.8 percent increase hotel occupancy and more than a 10 percent increase in the property’s average daily room rate. Casino revenues also increased, boosted by an 8.4 percent rise in table and slot game revenue. Food and beverage revenue increased 11.6 percent. American Casinos is not publicly traded but has public debt. Bank of America recently expanded its mobile technology to Las Vegas to allows bank customers to take cash out of their account at certain ATMs using a smartphone. The valley is expecting 14 ATMs to have the new technology — out of a planned rollout of 5,000 machines by year’s end. By the end of May, 2,400 machines were pegged to be in service with the technology, the bank said. Customers using one of the bank’s digital wallet technologies, available on several phone types, can use cardless-enabled ATMs, identified by a contactless symbol near an ATM’s card reader. Customers must also have their debit card loaded into a digital wallet to access their funds without a card. The Nevada Department of Transportation has awarded a contract to WSP | Parsons Brinckerhoff to design improvements to the I-15/US 93 Garnet Interchange in North Las Vegas. The transportation improvements are in connection with the planned $1 billion Faraday Future car manufacturing facility in the City of North Las Vegas. Included are safety and capacity improvements to the I-15/US 93 interchange, widening of US 93 for five miles and related intersection improvements. Under its contract, WSP | Parsons Brinckerhoff will prepare environmental documentation and preliminary design for the interchange improvements. Environmental documentation will involve field studies to identify any significant cultural and biological resources in the project area. Concurrent to the preliminary design effort, the firm will assist the Department in a design-build procurement to deliver the project. Construction on the project is slated to begin in June 2017.